As our client you have the option to get your bandwidth billed per order instead of the standard "per server". This gives you the ability to spread your usage over multiple servers. 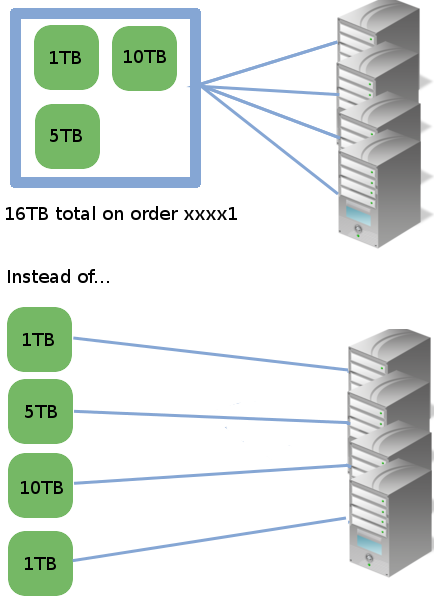 For example; a simple webserver in most cases does not consume as much as 1TB of data per month. If you have more than one server with us you can choose to merge the bandwidth amount. This way you do not need to buy extra bandwidth on a server which does not (if it is a local network server), or does not comsume as much bandwidth as a full production server. Of course this is optional, if you want a bandwidth pack on a per-server basis that is also possible. * Overusage is billed normally. NFOrce Entertainment B.V. © 2019 (21:06 CEST), all rights reserved.